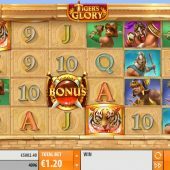 Tiger's Glory slot is Quickspin's first ever 6-reel multiway game which adds this Swedish developer into the fold created by WMS' Raging Rhino with Big Time Gaming's Danger High Voltage and Thunderkick's Pink Elephants being other notable games in the category. There's no jungle or animal theme here though despite the name, in fact the reels are set over the Roman Colosseum and the tiger seems to be a gladiatorial opponent for some of the Roman characters. To that end we get some dramatic epic movie-style music as our soundtrack and when the reels stop too, so will our bankroll escape the jaws of this very angry predator? We have 6 reels of 4 rows each on Tiger's Glory and 4096 ways to win so no actual fixed pay lines. The symbols are single or double-stacked and it is possible to get 3 on a any given reel which means with all those ways there could be some serious big-win potential. 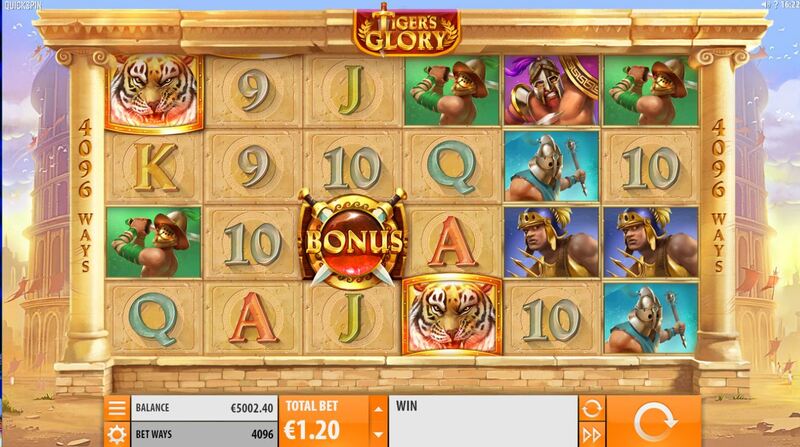 Naturally the Tiger is the premium 6-of-a-kind win paying 10x the 20-coin minimum bet at 200 coins, pink or purple Gladiator 125 coins, green or blue Gladiator 100 coins with six card values paying 60, 50 or 40 coins. Wilds appear singly on the centre 4 reels and bonus scatters on all 6 reels. Now any good 4096-way slot must have an exciting free games round, right? So you get 7 free games for a basic 3-bonus scatter trigger up to 20 for all 6 landing. They don't pay any prizes though unlike in Raging Rhino but you get a weird and wonderful free games round. Some of the Tiger symbols may have a red background and be 'enraged' when thay land. They will then have a fight with the Gladiator and should they slash him to death they will remain in position and add one extra spin. Above each of the six reels is a +1 gold token which will disappear when a Tiger lands on it and then becomes sticky. You still get normal Tigers too and these pay scattered in the free games so if you have one on each reel not only do you receive the maximum 6 extra spins but are guaranteed 6-of-a-kind every subsequent spin. The Enraged Tigers will also count as normal ones so will combine with them in scattered wins. Unlike the normal Tigers though, Wilds don't appear in the bonus.